Virtually all companies have confidential information that they need to protect from being viewed by competitors or the public. But if there is no deliberate process in place to effectively destroy this data, they put themselves at risk of security breaches and/or theft of customer data. Some mistakenly believe that because they run secret documents through in-house paper shredders, they have everything fully covered. But what happens to that shredded paper after it gets sent out to the trash? If you are not safeguarding it, this paper can be stolen and reconstructed by thieves. At J&K Document Shredding Philadelphia PA, we understand the need to take necessary steps to properly dispose of your sensitive data. We have been a member (in good standing) with the National Association of Information Destruction (NAID) for several years, and we stay continually on top of all the latest developments and advances in the document shredding industry. As NAID members, we are held to the highest standards of quality and excellence, and businesses can rely on our services to ensure their sensitive data is properly disposed of. In fact, we are completely transparent, enabling our clients to view our document destruction process in real time via closed circuit television. Medical identity theft is on the rise, with over 1.4 million victims and growing. On average, identity theft in the medical world costs victims around $20,000 per case, with over half of victims reporting the need to pay for unnecessary medical care in order to get their coverage back. In addition, around half of all victims lost their health insurance because of fraud, and about one-third saw their premiums go up after their medical information was stolen. Finally, less than 10% of victims report the ability to bring their cases to full and satisfactory resolution. J&K Document Destruction Philadelphia PAgoes to great lengths to protect the confidential data of medical consumers by ensuring that all private records are properly destroyed before it leaves your premises â€“ this keeps private consumer data protected and reduces the risk of theft. Our specialists have in-depth knowledge of the data destruction process; including properly handling charts, paperwork, and electronic data. This not only gives your data an extra blanket of security, it also reduces costs of labor, equipment and maintenance by not having to employ this process in-house. Attorneys and law firms often deal with private information during regular interactions with clients, and it is critical that this information be kept safe. Sometimes, there is also a need to get rid of this information. However, if you fail to dispose of confidential data properly, you can end up with heavy fines, penalties, and a tarnished reputation. At J&K, our professionals use the latest methods to securely protect your data while remaining in full compliance with all rules and regulations. 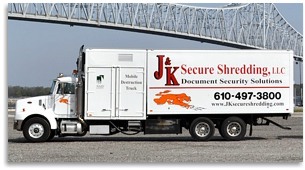 J&K Legal Document Shredding Philadelphia PA helps legal practices both large and small in Pennsylvania and New Jersey. No matter what size firm you have and what type of law you practice, our cutting edge solutions give you assurance that your confidential information is fully disposed of. 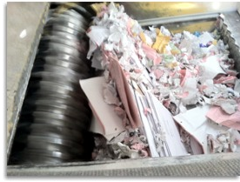 For document destruction, we provide convenient and secure on-site services. For destruction of hard drives and other media, we have a secure and efficient process at our facility. We also fully recycle all destroyed material. Finance is one of the most highly regulated of all industries; with strict rules and regulations around data disposal and heavy fines for non-compliance. In this industry, having a professional data destruction service is a must. At J&K, we can assist your financial institution by ensuring that all your outdated documents and records are disposed of in a way that keeps you in full compliance with all governing laws and regulations. In the financial world, one of the biggest concerns is keeping sensitive customer information away from identity thieves. This is why you need to ensure that the data of your customers is kept safe at all times. J&K Financial Document Shredding Philadelphia PA advanced data destruction methods help financial companies maintain their customers' confidence by keeping their private data safe.